Hi! So I've been trying to ease up on my conditioner whorish ways, but it's not working. I thought maybe my new year's "hair resolution" of no cones would help...nah. Ok maybe a lil bit. Thing is, products without silicones aren't as cheap, or they either come in super small sizes. So I find myself spending even MORE money! Anyway, I digress. 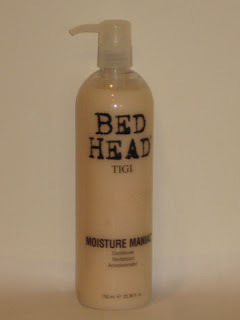 I picked up this TIGI Moisture Maniac conditioner at Marshall's. I'm not gonna lie, the $11.99 price tag is steep in my book considering I usually get liters of conditioner there for $5. But I've heard so many great things about this conditioner I decided to give it a whirl anyway. Well let me tell you....I wish I hadn't. Now I'm hooked! As soon as I put it on my hair, it melted in and my hair felt like the silkiest buttered curls. LOL I mean I was in the shower in disbelief, it just did not feel like my hair. In fact, I think this may take the place of my beloved Pumpkin conditioner. I haven't tried it on a wash and go yet, but if it works then that seals the deal. I saw that conditioner in target n girl my product junkyism had me on lock lol. I just subscribed and i love ur blog so far. Just bought this product a few days ago and I'm already in LOVE! !